When people have 'tips and tricks for organizing' on the Internet, I am all on it. Some are so strange that I am not sure that a gremlin is typing and laughing all the way. But I know that with all the great uses for the Binder Clips, whomever created them is laughing all the way to the bank. If you remember, some of my Organization Tips, I used binder clips and straws to create places to keep those small things that get to be everywhere! But those darned threads, I have tried the small clips and ponytail holders. The clips, IMHO were crimping the thread - an absolute NO-NO! The ponytail holders covered up the color of the spool. 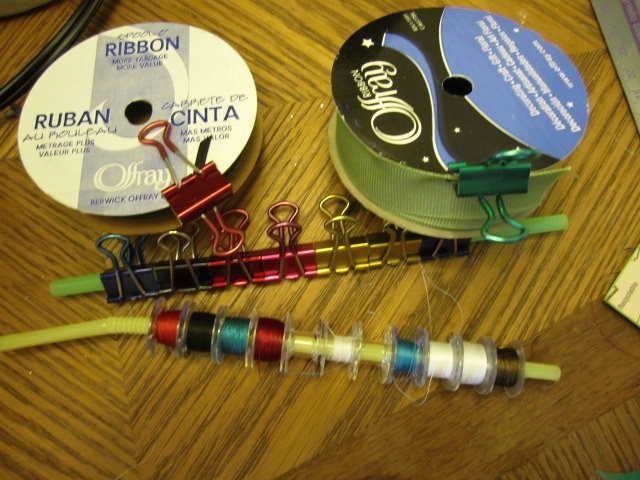 One of the responses in my blog (link above) described how to hold the stray strings from your bobbins. I just got around to trying her suggestion and was totally bowled over on how inexpensive and easy it was to do. The PVC hose cuts easier if it is warm.